Sanborn Fire Insurance Maps are meticulously detailed, large-scale lithographed, color-keyed street maps created for all sizes of cities and villages. The maps are at a scale of 50-feet to one-inch on 21" x 25" sheets of paper. Sanborn Maps helped insurance agents in the late 19th and early 20th centuries determine the degree of fire hazard associated with a particular property. The Society's Archives has original Sanborn Fire Insurance Maps for 325 Wisconsin communities. It also has a complete microfilm edition of Wisconsin Sanborn Maps (in black and white). Most maps date between 1883 and 1930. We are grateful to the American Geographical Society Library at the University of Wisconsin-Milwaukee for sharing their digital images of the Milwaukee Sanborn maps. Their generosity saved us from having to scan more than 1,000 large, fragile sheets in the Society's collection. 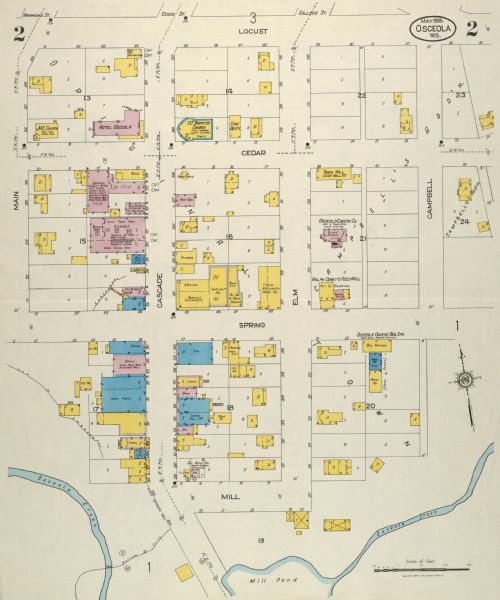 Society staff have digitized our Wisconsin Sanborn maps predating 1923, which are now available in our online map collection. Search by keyword, geographic location or date. The Wisconsin Sanborn maps are arranged alphabetically by city in the Archives. Each map is color-keyed and divided into numbered sheets. Each map has a detailed set of symbols indicating the features of individual buildings. Guides are available for more information on how to use the maps. Several Area Research Centers (ARCs) have original Sanborn maps for at least one city in their respective regions. Also, some have black-and-white microfilm map copies for their regions. Sanborn Fire Insurance Maps typically focus the business districts within communities. Each map provides a detailed assessment of the buildings within a district and features of the district itself. Assessments include an outline of each building and outbuilding. They document the size and number of stories of every building, the location of windows and doors, fire walls, and indications of sprinkler systems. They note the nature of the business or businesses which occupied individual buildings, sometimes even particular room uses. They list the type of construction and the composition of building materials including the framing, flooring and roofing materials. The features of the district include street names, street and sidewalk widths, property boundaries, locations of fire hydrants, locations of water and gas mains, and even the names of most public buildings, churches and companies. They also document the strength of the local fire department and the presence of fire hazards such as blacksmith forges, large baker's ovens or stored kerosene, and the existence of firefighting equipment, cisterns or community water works. Rivers, canals, railroad corridors and similar features are also noted. Some maps also include large portions of residential areas. Individual homes are recorded with the same precision as large factories. Surveyor D.A. Sanborn founded the Sanborn Map Company in New York City in 1867. There was great demand for fire insurance assessments after the Civil War, when many wooden structures were built. The company's system for standardizing maps proved so successful that it became the largest American map company. Sanborn Fire Insurance Maps are an excellent way to view urban growth and development. They are valuable for urban specialists, social historians, architects, geographers, genealogists, local historians, planners, and environmentalists. Sanborn maps do not circulate and must be used at the Society's Library or Archives. Several Area Research Centers (ARCs) have original Sanborn maps for at least one city in their respective regions for viewing. Photocopies of documents in the physical collections are available for a fee. High quality map reproductions suitable for framing may be available for purchase from the Wisconsin Historical Society. For more information about purchasing a reproduction or licensing for commercial use, email the Library Archives staff. Sanborn Map Citations vary depending on your source.